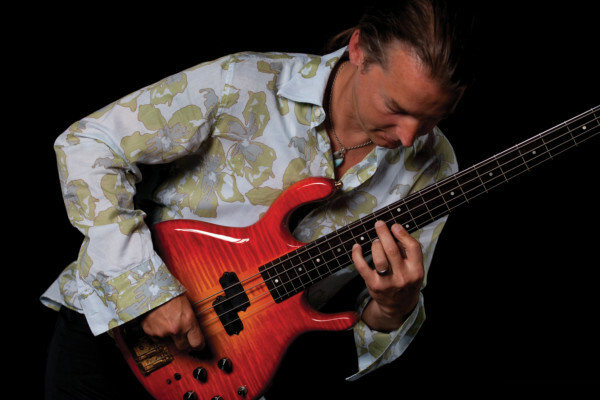 Doug Johns’ virtuosity on bass and compositional prowess plants him firmly as one of the top funk players in a genre with a reputation for precise attack and ultra “in the pocket” approach. Johns’ playing and compositions span multiple styles, making him a sought after musician. The bassist has performed alongside artists as diverse as Victor Wooten, Chuck Rainey, Buddy Miles, and the LA Mass Choir. His passion for the bass has also brought various bass clinics and an instructional video series, Opening the Slap Style Bass Vocabulary. Always pushing the envelope, Johns has recently released Stank, the follow-up to the highly acclaimed Pocketful of Nasty and his self-titled Doug Johns debut. We caught up with him to get some perspective on his background and his future plans. What music was being played around your house and in Cleveland when you were growing up? Ray Charles, Thelonious Monk, Frank Sinatra, Frank Zappa, Led Zeppelin, Jimi Hendrix, Pat Metheny, Weather report, Freddie King, Earth, Wind and Fire, Tower of Power, and more Ray Charles. Not until I got older did I realize how lucky I was to “grow up” on such great music. All of these artists – and more – have and still do continue to be a big influence on my musical existence. No, drums were. I understand now how important that was. I think when you’re young, drums seem like the ultimate; you know, you can just beat on ‘em! But any type of percussive instrument learned in the beginning is such a crucial first step to developing / understanding rhythm. And we all know that rhythm is the whole deal! But at the same time I was introduced to drums, my older brother (also a great musician), was learning the guitar, so that was something I was kind of “learning over his shoulder.” I was very lucky! When did you realize that bass was going to be your “main” instrument? Well, when I was young, I was playing in a band with my brother. He played guitar and had this smokin’ drummer, and so my brother said, “You should play the bass. We need a bass player.” So, like a lot of bass players have experienced, I picked the bass up out of necessity – and I’m glad I did! But even then, I don’t think I knew it was going to be my “main” instrument. I always kind of dabbled with a little bit of drums, a little guitar, but I stuck with and focused on the bass. Even so, playing a little of any instrument I could get my hands on definitely opened up my sense of composition. Tell us about your first bass, and how you ended up with your road-worn Pedulla. Any other basses in your collection? Ahhh, my first bass was a copy of a Fender jazz bass I bought off this guy that I sat next to in high school English class. Or maybe it was a “Global” bass ordered from the Sears catalogue… Remember the Sears catalogue??!! My main Pedulla is a 1986 Buzz Bass with frets installed. It’s pretty much stock electronics, maybe a pre-amp update. That bass and I have so much history. I remember when I got it: I was on the road (1986-87) and playing with this killer funk/dance band, and I just happened to see that Pedulla in a local music store. Well, I didn’t have the money to buy it. But the band I was with at the time did something so generous that I’ll never forget – they all pulled together and took less bread that week on our gig money, just so I could get that bass! Wow! Now that’s a true band of brothers – pulling together for the greater good. Who knows, maybe they all wanted me to get another bass ‘cause the one I had sounded like crap!!? Either way, I’ll never forget how kind it was for everybody to take a cut in pay so I could swing buying my Pedulla! The same one I still use today! I also have a Fodera Monarch 6, a 5-string fretless Tobias Growler, A Jon Hill custom 4-string, and new to the family, a new Pedulla. Yep, I got another 4-string almost identical to the one I’m playing now. Of course I need to spend some time on it developing a relationship, finding its idiosyncrasies, and letting it find mine. I think it’s so important to put time into your instrument, and get to where it can effortlessly work as a conduit to release your inner soul. When did funk music pull you into its grip, and which funk and jazz bassists helped influence your style? I would say that I never consciously looked at it as “funk music,” just good music that moved me. I just love that forward pulse that makes you want to move and groove… No doubt, I’m a Rocco Prestia fan. Rocco just has such a way of dancing around the tune in a deep funkified way. Jaco and Stanley were both influences, of course, as well as Larry Graham. 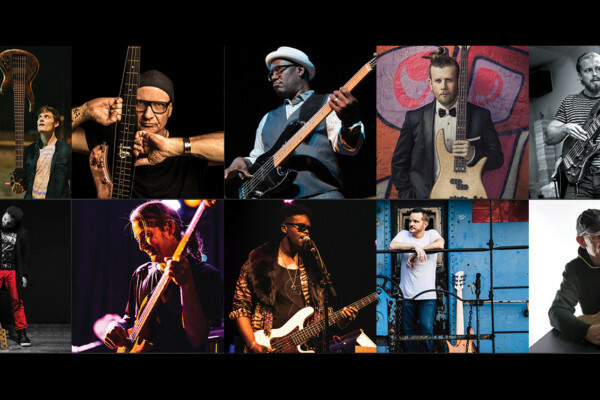 I know the question is about what “bassists” influence my style, but I gotta tell ya, I’ve always been influenced more by the attitude of great artists – and although bass players are a part of that, I would say drummers, guitarists, keys, etc., are just as much a part of my evolution. Case in point: I’m a huge Hammond organ fan, and a lot of my ”coming up” was playing in Hammond trios, diggin’ on some Hammond B-3 left-hand bass lines. That’s probably what has influenced me the most! In addition to performing, you teach a fair number of clinics. What do your clinics consist of? I love the clinic setting. At a DJ rhythm workshop clinic, no two are the same, and I think that’s good. I try to keep it in an improv setting – controlled chaos if you will. Sure, I do have some opinions and outlooks on things I’m readily available to talk about. 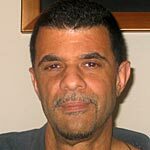 But I think each clinic is (and should be) influenced by the people who attend. My clinics rely heavily on audience participation, and I try to create / exude an energy which allows openness and the freedom to ask anything. I do always try to have a drummer at my clinics, because that helps me to stress that rhythm is the whole deal. Let’s face it, us bass players are probably playing 99% of our careers next to a drummer, and to be able to talk about the ins and outs of that drummer / bass player relationship makes for such great conversation. Some of the clinics I do are more “gear” focused, where I’m there to demonstrate for a particular company, in recent cases, Genz Benz amps and Pedulla. I’m grateful for their support in the clinic domain, and honestly, couldn’t do it without them. What I love most about these manufacturers is that they want me to just be myself, which is the way it should be. I’m no salesman, just a bass player. One of your unique talents is being able to play bass and drums at the same time. How did that come about and how much practice did it take to perfect? First off, me and perfect cannot be used in the same sentence. What, if any, scale/finger warm-ups do you use before a gig? Well, I’ve always tried to loosen up on my instrument before performing, although I don’t do anything in particular. But as I’ve grown I’m learning different methods. I really dig Yoga and truly believe in breathing exercises. Try it right now – breathe in deep through your nose, and exhale longer than you normally would. Feel that? That is a good place to be. I’m learning that mental/spiritual preparation is so crucial that it almost overrides the physical side of things… but not completely. Tell us about your partner in rhythm, drummer Chris Ceja, and how long you’ve been playing together. Together you two lock in to each other and make tight grooves. How often do you rehearse and what do you concentrate on? Chris is like a brother to me. Off and on, we’ve probably played together 25+ years. In the beginning we would play in 4-5 different bands at once, just diggin’ in on the scene. We’ve always had similar musical interests and love improvisation. I think a lot of our groove comes from years just playing in many different musical situations and from experiencing life together. That’s what I think you’re hearing when you refer to our “tight” groove. Back in the day, we would just rehearse for hours and hours on end, challenging ourselves in every way we could think of. Always recording, we’d practice in the dark, early, late, inside, outside, all sorts of ways on a quest to improve. Naturally, when rehearsing for upcoming dates – whether it’s with Chris or not – the rehearsal needs to be more focused on the current set. But I’m still always a kid at heart, looking forward to the jamming either before or after the scheduled rehearsal. What is the idea behind Stank? Why did you choose the songs and styles you did? “Put some Stank on it! !” That’s a phrase I think everyone’s encountered once or twice in their life. With each CD I record and produce, and I think this is true with most artists, you hope to get closer and closer to revealing your soul for everyone to feel in that moment. Stank is a great representation of that for me. A lot of the songs on the album are things I wrote many years ago, but I needed to spend time to learn how to get my confidence together before I could get them recorded the way I heard them in my head. The songs on Stank cover the emotions and feelings of where I’m at in my life, and I’m cool with that. Style wise, I just always put “song first” and everything else seems to fall into place. The horn arrangements throughout “Stank” are pretty hot, and I especially love that barking baritone sax ala T.O.P. Did you help arrange those charts? I’m a huge horn section guy – there’s nothing like the power of a tight horn section! I’m so lucky in that my good friends Kenny Anderson and Joe Miller (Arturo Sandoval, Gloria Estefan, Tom Jones), love playing my stuff. For some songs, I totally hear the horns in my head and have a definite structure as to what I think the horns should be doing. But my musical mind is no comparison to Kenny Anderson’s! Sometimes I’ll simply have a nasty rhythm track, and Kenny pulls out his horn and starts layering. On some songs, we collaborate and shed the ideas together, and sometimes it’s all 100% Kenny and Joe. And I think that’s the right natural approach – let the horns do their thing, let a guitar player be a guitar player, etc., It’s ultimately up to me to produce the recording arrangement in the direction I need, but it’s definitely a collective effort. I’ve heard from horn players (more than once!) that I need to stop writing my “lines” on the bass – but sometimes that makes for some really cool voicing when it comes to the horns and their harmonies. And yes, I’m a huge baritone sax guy. The inherent qualities of a bari transfer so well to bass guitar and vice-versa. I plan for 2011 to be my busiest, most productive year yet, starting with the launch of my completely re-designed website. 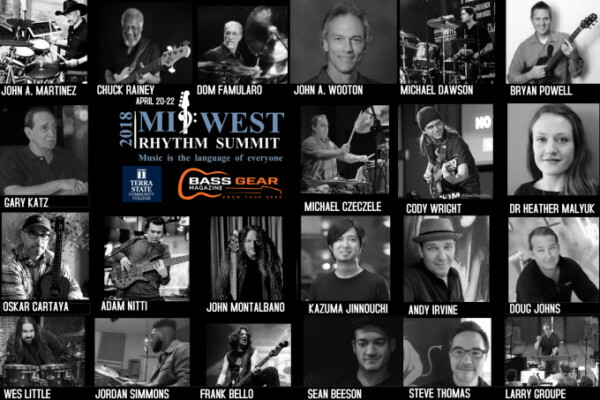 My schedule is filling up with a ton of Genz Benz clinics, which I hope to do with a number of different drummers. I’m really pushing to book an overseas tour sometime later this year. And I’m really excited about the production and release of one or two DVDs, including a live show with a full band, as well as something more instructional in nature. But my number one goal for the months ahead is to keep growing the connection I have with my fans. Beside playing the bass, my favorite thing about performing is the human connection my music is helping to create. I meet some of the best people out on the road, and I am always looking forward to the opportunity to keep that energy flowing. Check out more about Doug at dougjohns.com. You make that Pedulla sing!